Monitoring a weak thruster, commander Sergei Volkov guided a Russian Soyuz spacecraft to a smooth automated docking with the International Space Station at 5:18 p.m. EDT (GMT-4) Thursday, wrapping up a two-day orbital chase that began with blastoff Tuesday from the Baikonur Cosmodrome in Kazakhstan. 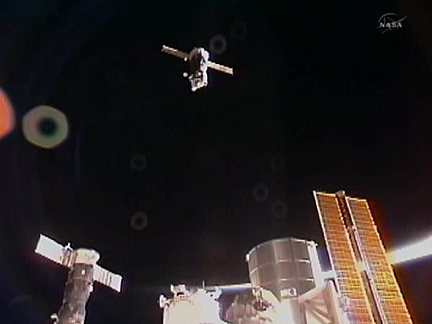 "Contact confirmed," someone said in Russian as the Soyuz TMA-02M spacecraft's nose engaged the docking mechanism on the station's Rassvet mini-research module. "Congratulations, Sergei," a flight controller radioed. Because of trouble with a thruster that was not delivering full power, Volkov was prepared to take over manual control of the Soyuz TMA-02M spacecraft to kick off final approach to the station. But as it turned out, the spacecraft was properly aligned and a manual firing of the under-performing thruster was not required. 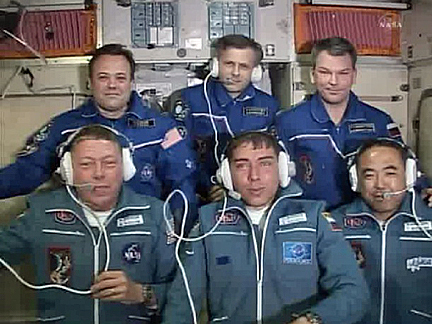 After extensive leak checks, Volkov, flight engineer Satoshi Furukawa and NASA astronaut Michael Fossum opened the Soyuz's forward hatch at 8:34 p.m. and floated into the space station, welcomed aboard by Expedition 28 commander Andrey Borisenko, Alexander Samokutyaev and Ronald Garan, who were launched to the lab complex on April 4. "HI Mike, this is Mel," Fossum's wife, Melanie, radioed from mission control in Moscow. "Sending congratulations from your sons, your brother here in mission control, Moscow, from your daughter, from Terry, Jonathan, Emily and Rebecca in mission control Houston. "We're very proud of you for what you've accomplished in your training to where you are right now, we're very excited about what you will accomplish with your crew, we're very eager to have you back to share in all that you've been through in this great mission. Go with our blessing and God's protection. I love you." "Love you, hon," Fossum replied. "You guys have the hard job, standing on the sidelines and watching us take off and do this. So I thank you very much, God bless." One of Fossum's four children took the telephone a moment later, saying "hey there, Dad, it's your favorite son John here. I'm really happy to see you guys all there safe and all smiles, it's really cool to see your face. If I ever decide to go back to the states after this, I'll be seeing you there. So. Take care." "John, you have a good time in Moscow, but not too good a time!" Fossum laughed. The station's expanded six-member crew will face a busy month of work to ready the station for arrival of the shuttle Atlantis two days after launch on July 8. Making the shuttle program's final flight, Atlantis and a crew of four will deliver a cargo module loaded with enough supplies to keep the lab crew operating at full strength through 2012.